BetChain Casino is one of the latest online bitcoin casino companies we have made a deposit with and cashed out with no problems. Offering a variety of crypto-currencies, including bitcoin cash, ethereum, litecoin and dogecoin casino in addition to the standard bitcoin, BetChain Casino operates professionally and is extremely easy to get a hold of if you have any questions or concerns. 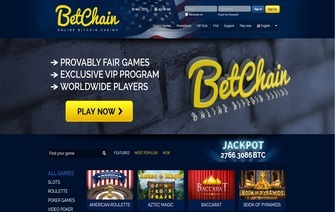 BetChain Casino offers a full range of games. Some of the games that come to mind include Blackjack, Baccarat, and Slot machines. We do not have any outstanding complaints on file about this company, which shows how solid of a company it is. BetChain has a variety of games you can play where they offer solid limits for smaller players and bigger players alike. As we have mentioned, BetChain offers blackjack as well as 3 types of roulette, various slots, and video poker. BetChain Roulette is one of the games I like to play when I’m up overall and it is clearly is one of the games where you can increase your profits the most. BetChain offers three types of roulette, American, French and European. I have spoken to some BetChain players who actually only play Roulette as they have more luck with this game than any other. BetChain has a wide range of 12 different slot machines to pay. These are five-reel games with some, like Crazy Starter, having 25 paylines. Many offer bonus spins as well. BetChain Casino is very generous when it comes to their welcome package. Bitcoin casinos with a bonus policy are few and far between as is, but that hasn’t deterred BetChain from offering multiple bonuses, all of which are really top-notch. For your welcome bonus, you get a 100% Welcome Bonus up to 1 BTC/€200 + 200 Free Spins. After that, you get a 75% bonus up to 0.5 BTC on your second deposit, and a 50% bonus up to 0.5 BTC on your third and fourth deposits. Highrollers can get their fair share of goodies with a whopping 75% bonus on minimum deposits of 2 BTC. There are loads of weekly bonuses too, such as 15% Cashback Tuesday (up to 0.1BTC); 50% Reload Wednesday (up to 0.25 BTC) and Free Spins Friday (up to 50 free spins). License(s): Operated by Betchain LTD Casinos, no licence listed. BetChain Casino is one of the only BitCoin casinos that offers such an enticing loyalty program. Play at BetChain Casino and you will earn money back as you go. Bonus Just make a deposit and grab a match 100% bonus up to 1 BTC + 200 free spins! Keep in mind that rollover requirements must be met. BitcoinCasinoPro.com runs on an affiliate marketing business model. We do our best to accurately review sites so that our users can have a safe gaming environment. We pride ourselves on reputation and have been honest in all appraisals. We are not a gambling site and do not accept wagers in the form of any currency or crypto-currency. We do not accept payments from operators in return for higher rankings, but we do receive a revenue share commission. The user should understand that while we maintain high standards, circumstances change and we cannot control the actions of third party websites.